Moscow : Mondrago. Das Spiel. The game. El juego. El joc. Il jeu. MONDRAGO on the Datscha ! Hi Petr Antonov! Special thanks for the funny foto. Very „charming“. 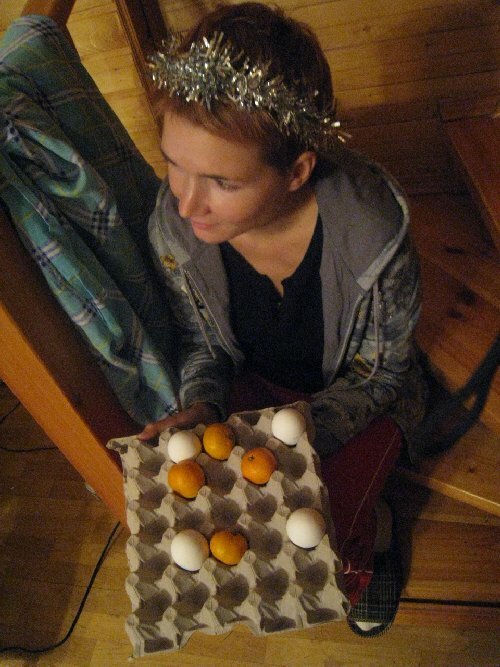 It looks like the „Mondrago-Queen“, playing Mondrago with tangerines and eggs! The gameboard, you’ve found, is very perfect. Always the eggs wins! Hope, you still have fun playing Mondrago with your friends passing the strong winter. Greetings from the Mondrago-Community in Berlin to Moscow. That’s great! Now we have a russian translation of the MONDRAGO-Rules. Thank you, Petr! Guess, you are the first MONDRAGO-Player in Moscow! Keep it fresh!